Eclipse demos using the Yardstick Eclipse activity are some of the simplest and most popular activities for astronomy outreach events. While the yardstick eclipse activity is relatively easy to set up, the demo does require a strong, steady light source to effectively work. If you are volunteering at a daytime event with clear weather, then the Sun is a perfect light source – just like in an actual eclipse. But what if the Sun isn’t out? What if it’s dark, cloudy, or you are at an indoor event with scattered lighting? Jerelyn Ramirez of the Kansas Astronomical Observers created her own sturdy, powerful light box as a solution, which she shared with the NSN community during the recent Shadows and Silhouettes Tookit webinar. 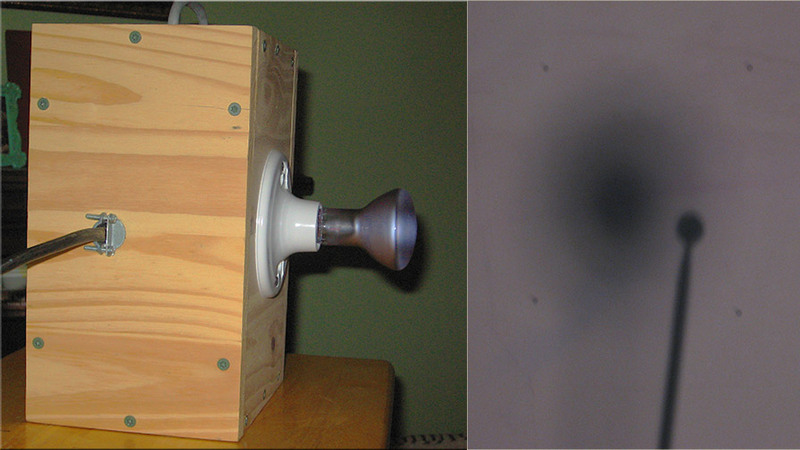 "I use a homemade box with a 45W incandescent light bulb. It is a small indoor flood light, and it's an AC setup so it must be plugged in. I re-purposed the power cord from an appliance I was throwing out. It was great because it was a long cord, and 12 guage wire. I orient my light box so the light is directed toward the yardstick activity. The light bulb sits about 64 inches from the Earth for best results, with the Moon side of the yardstick an inch or so from the white board. This setup gave me a nice example of the Penumbra and Umbra shadows of the Earth (pictured above). This really helped me explain what an Umbra and Penumbra is. I have had visitors that don't understand that the Earth casts a shadow out in space and the Moon just happens to move right through it."